One-Punch Man has been on a break for a few years now, but the shonen was bound to return before long. At last, Saitama has returned to the screen for a second season, and it seems its premiere held a little gift for fans. 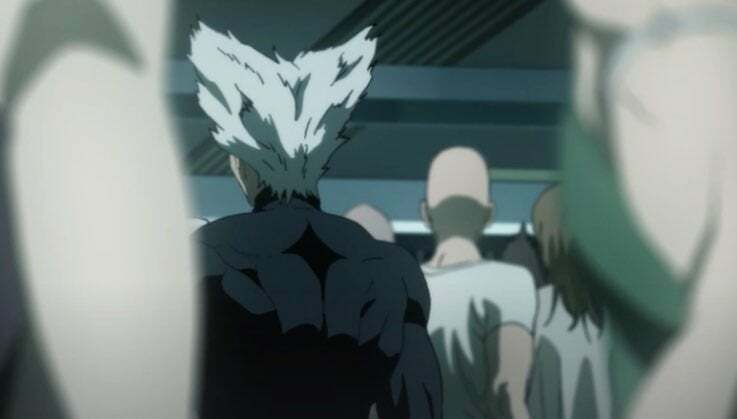 Recently, Hulu brought the premiere of One-Punch Man season two to fans, and it caught up with the likes of Saitama and Genos. The episode was a slow-roll back into the title’s universe, but it did end with a massive teaser of what’s to come. After the end credits rolled, One-Punch Man hit up fans with a scene. It checked back on the big meeting hosted by the Heroes Association where its leader asked villains to give them a break. With an apocalyptic prophecy on the rise, even S-rank heroes are busier than ever, but the villains were not ready to help. So, this scene checks in on them flexing their power, but one bad guy is shown in particular. The scene focuses on a buff guy wearing a skintight black shirt with some gravity defying gray hair. Donning a rather terrifying smirk, the unnamed man finds himself rather interested in the prophecy mentioned. “Hey, hey, hey! This prophecy is pretty sweet,” the man says. For anime fans, they will not recognize this new face, but manga readers know him well. The guy is named Garou, and he is one of One-Punch man’s most famous villains. He wants to become an actual monster and bring down every hero to watch the world burn. So, you can imagine how things go when Garou comes up against Saitama for the first time. So, did you stick around for this additional scene? Let me know in the comments or hit me up on Twitter @MeganPetersCB to talk all things comics and anime! One-Punch Man Season 2 is now streaming on Hulu, and on Crunchyroll outside of the United States. The season is directed by Chikara Sakurai (Naruto Shippuden episode director), for new production studio J.C. Staff. Yoshikazu Iwanami serves as sound director, and Chikashi Kubota contributes new character designs. The second season will reportedly run for 12 episodes, and Viz Media has licensed the season for an English release. They describe One-Punch Man Season 2 as such, "Saitama is a hero who only became a hero for fun. After three years of “special training,” he’s become so strong that he’s practically invincible. In fact, he’s too strong—even his mightiest opponents are taken out with a single punch. Now, the great seer Madame Shibabawa’s prediction about the Earth being doomed seems to be coming true as the frequency of monster incidents escalates. Alongside Genos, his faithful disciple, Saitama begins his official hero duties as a member of the Hero Association, while Garou, a man utterly fascinated by monsters, makes his appearance."